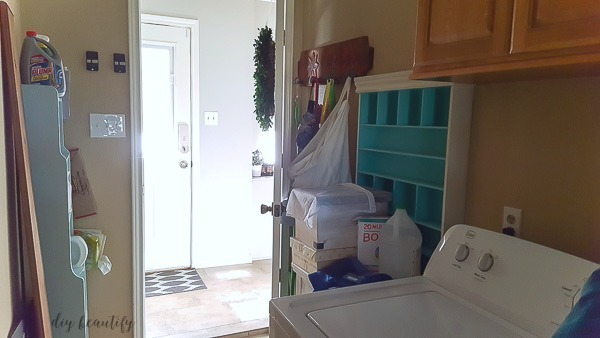 My current laundry room and my plans to infuse farmhouse charm for only $100! 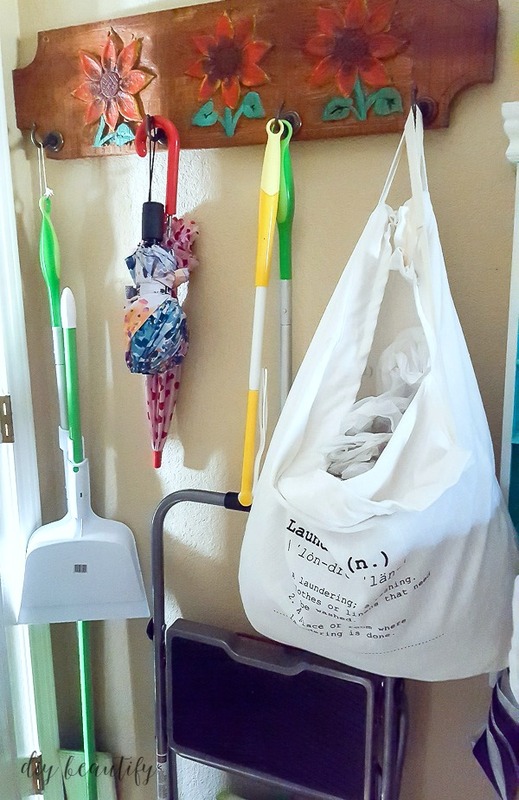 I'm no stranger to laundry room makeovers! In our last home, we completely redid our laundry room for under $200! New paint, new tile, new storage, and a clever way to disguise an eyesore were all projects that we took on. You can see that entire room makeover, before and after pictures and all the DIY projects in the reveal. Luckily for us, the laundry room in our new home has the basics covered. The floor has great neutral tile and there are existing storage cabinets - you know, the expensive updates! However, it needs to be refreshed, organized and made pretty. So when Erin of the home blog Lemons, Lavender and Laundry issued a room makeover challenge, I knew it was the perfect opportunity to motivate me to get this room done! I'm just one of several bloggers who will be participating in this room makeover challenge, and you'll be able to see everyone's makeovers, step by step along the way! Here's the deal: 5 weeks and only $100! Let's look a little closer at the current state of my laundry room. Are you ready for some ugly pictures? This long galley-style laundry room was added on to our home by the previous owners. They ate into the garage to create the laundry room...and I'm so glad they did! 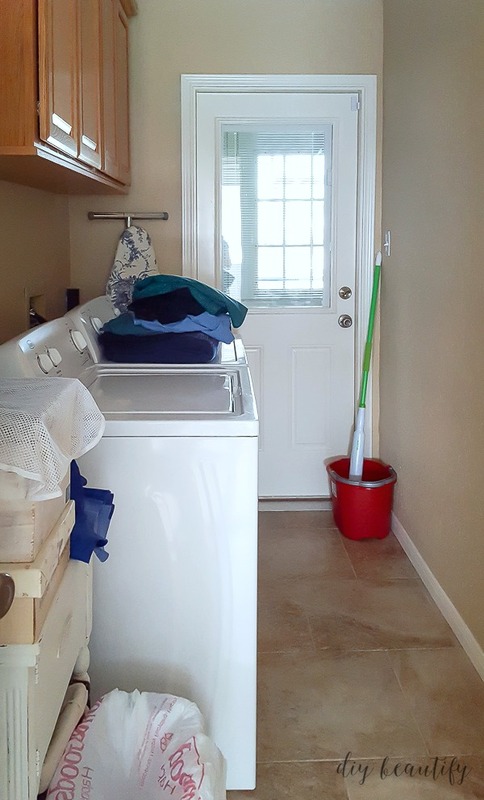 Having a laundry room under air is a BIG deal here in southern coastal Texas, where it gets very hot and humid! Here's the thing. When a room is not "done" to my satisfaction, I have a terrible tendency to let it get really, super messy! I just stuff things into this room and because nothing really has a dedicated place, it's one big mess! I'm excited to add functionality as well as beauty to this ordinary, small laundry room. As we've been settling into our home and making it ours, I've slowly been painting the walls and infusing our personality and style into each room. Changing the walls from beige to gray has really made our neutral furniture and accessories pop! You can really see that in the before and after shots of our kitchen, dining room and front sitting room (the rooms I've painted so far). Adding farmhouse charm to our laundry room is the next big job on our "to do" list. There might be a few bonus projects too, depending on how quickly the above work goes! This mood board I created shows you the basic look that I'm hoping to achieve. It's very neutral and the texture of the baskets, jars and wood shelf add that farmhouse charm that I love. I can't wait to share our progress with you each week, and to see this laundry room transformed for only $100! I know it's doable! 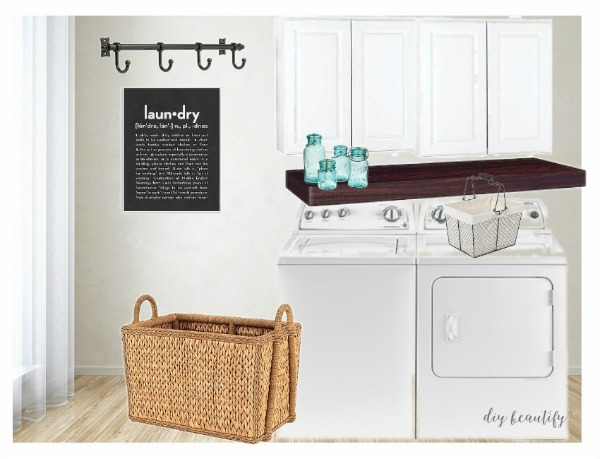 Okay, I've shared my plans to makeover my laundry room. 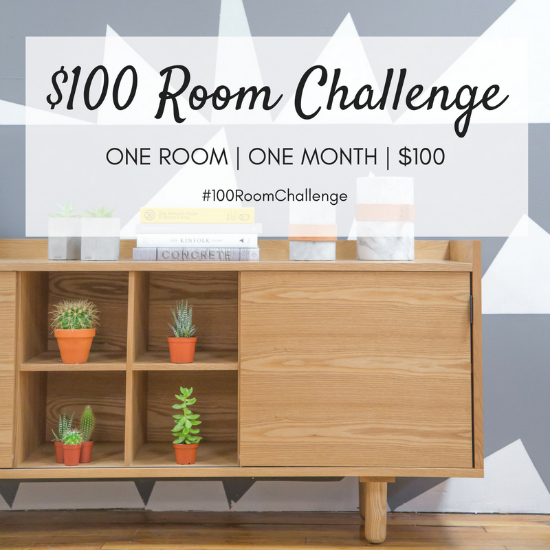 Now, check out which rooms the other bloggers are tackling for this challenge! Just click on each link below to see details! This is going to be great! I do the same thing in rooms in my house, if they aren't done to where I am proud to show them to someone else, then they are ignored and become gathering areas for junk! I redid my laundry room last year and couldn't be happier with it! Even my husband doesn't mind doing laundry in there now! I can't wait to see the progress, Cindy! All your redo's are fantastic! Thanks so much Michele, these first couple of weeks are going to be the hardest, with all the painting. I'm excited to see this room come together and become something I'm proud of! I am so excited to see the charm that you add! I absolutely love your plans for this space. I'm a "farmhouse style" person myself. 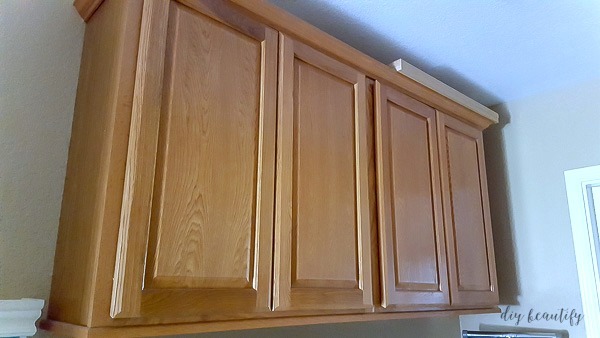 Painting the cabinets and walls will make such a HUGE difference. I can't wait to see how this turns out. So glad you joined the challenge. Good luck! Thanks Erin! Not only for your sweet comment, but for initiating this challenge in the first place! Sometimes I need a challenge to force me to get moving and get a room done! Your laundry room looks very similar to mine. This transformation will be fun to watch! I completely understand how you don't keep up a room that isn't exactly to your liking! I'm the same. Woo hoo, glad to see another laundry space! The white cabinets are going to look awesome--I'm doing a white/black theme for mine too! Brittany, I found in my last home that I was more apt to not mind doing laundry so much when the space was cute and functional! I look forward to checking out your progress as well! I commiserate with you about the cabinet height - I have trouble reaching the top shelves in our kitchen cabinets! Can't wait to see what you accomplish here. Thanks Sarah, I'm not going to be able to lower them much, and will likely need to keep a step stool handy...but it will be an improvement! Your cabinets are going to look awesome painted! I can't wait to see your reveal! I do the exact same thing with rooms... if they aren't my style it's like they just turn into junk pits! I don't know why I do this?? I can't wait to see your vision come to life! Cindy, I totally do the same thing. If I don't love a room it becomes the room that everything gets tossed into while I concentrate on keeping my pretty rooms....pretty :) I bet this laundry room will look fantastic in no time, and will no longer be your messy spot. Yes, that is the goal! It's funny to hear others do the same thing with their 'ugly' rooms!